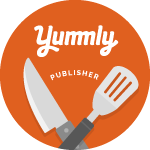 I first started sharing my local food life back in 2007 (as The Natural Princess). This was before the mainstreaming of the words "localvore" and "farm-to-table." Back then, I guess you might say those words had a bit more of a grassroots vibe, and I hate to admit it, but maybe a bit more realness to them. One restaurant that has been talking the talk and walking the walk since those early Connecticut farm-to-table days is Sugar + Olives in Norwalk. A recent media dinner at this low-key spot reminded me of why I became so passionate about local food to begin with and it helped reinvigorate my food blogging purpose. Plus, the food and the drinks were darn delicious from start to finish. Jennifer Balin opened Sugar + Olives in 2008 with the goal to not only make good food but to help connect people with where the food on their plates comes from. She is committed to not only serving local food but also committed to not wasting one bit of it. "We never throw anything away here," she told us. This 3-Star Certified Green restaurant is a bit off the beaten path, at 21 1/2 Lois Street in Norwalk, making it truly a hidden gem. There is no pretense here. The decor and the presentation are beautiful, yet down-to-earth. 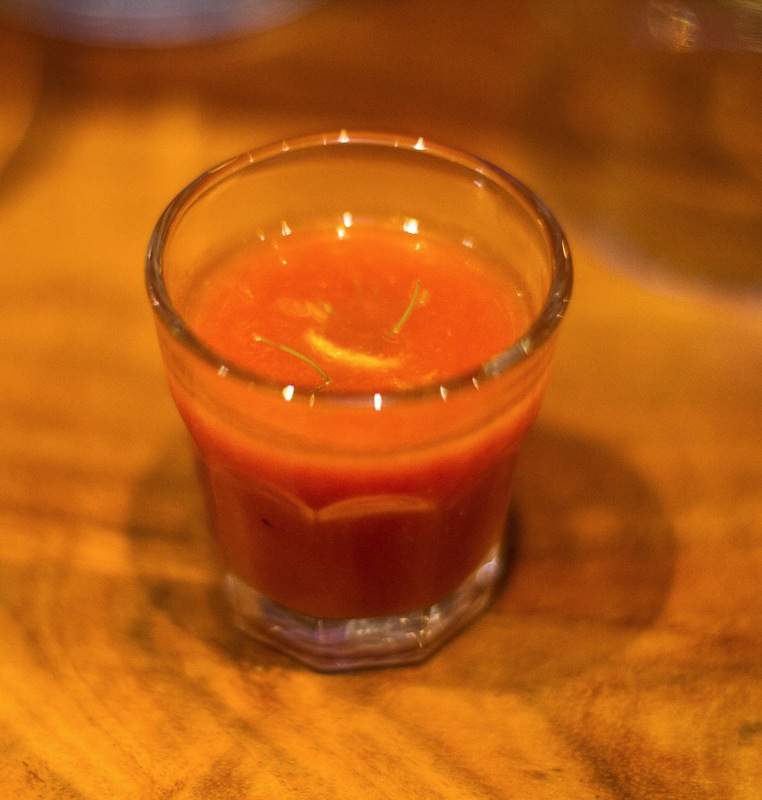 In the food and the drinks, there is a complexity behind the seeming simplicity. 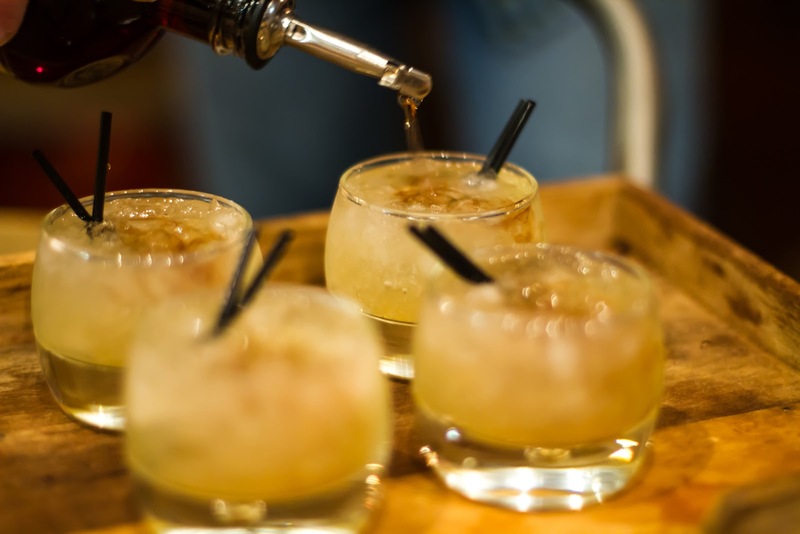 Before we get to the eats, let's talk about the drinks. Our first cocktail of the evening was the Chet Baker, made with Barcelo dark rum, sweet vermouth, Angostura bitters, Red Bee Honey and simple syrup. I like a strong cocktail and this is definitely a strong aperitif. It also happened to be one of my favorite drinks of the night. The ruby color of the beet blossom is amazing. 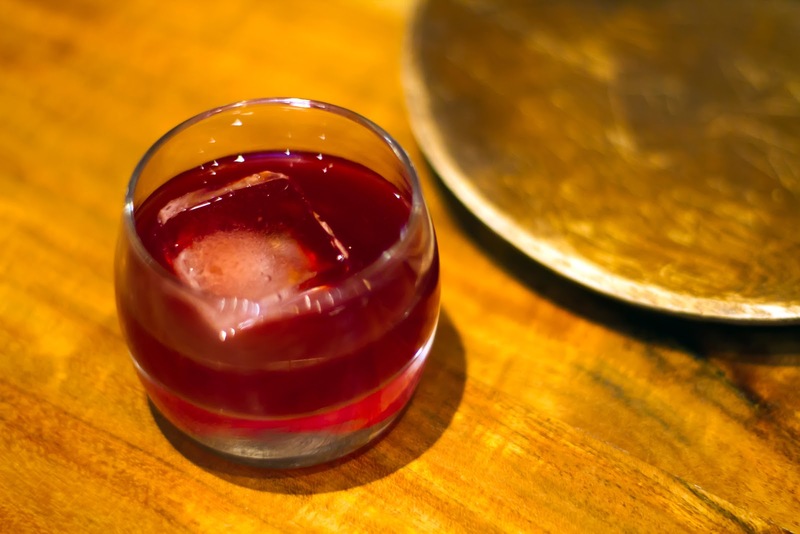 The earthy yet slightly sweet cocktail is made with beet syrup, organic gin, and lime juice. Before you take that first sip, you think it's going to be a fruity drink. I love the surprise that it's beets. It's a really, well-balanced cocktail. For the brush fire, bartender Chris Grimm smokes rosemary infused gin, then mixes it with lemon, simple syrup and a touch of Chambord on top. Smooth and smoky! My other favorite cocktail of the evening. 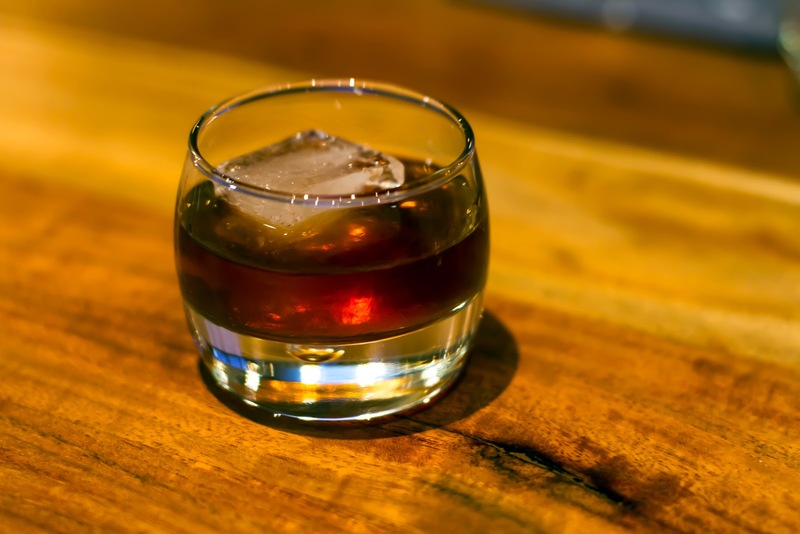 The Sugar + Olives sazerac is equal parts rye and cognac, Peychaud's Bitters and Angostura Bitters, in an Absinthe misted glass. Bold and classic. 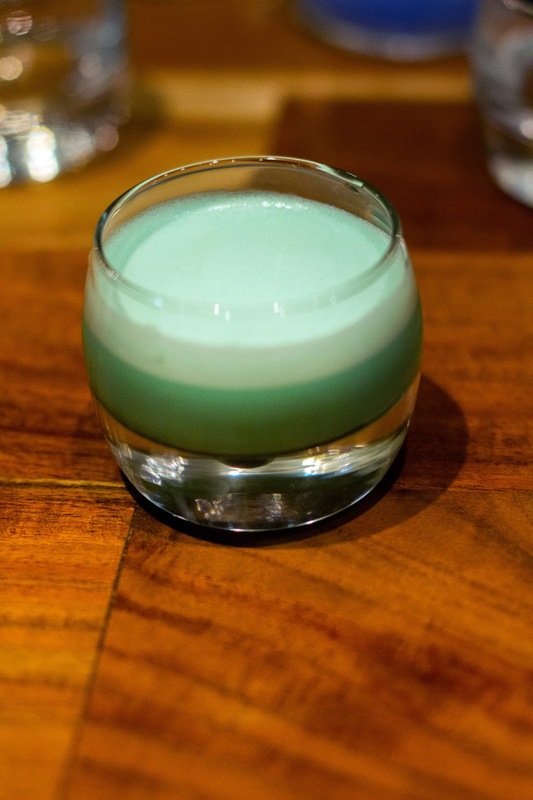 Paired with dessert was the grasshopper featuring creme de menthe, creme de cacao, and half + half. It's a glorious 1950s green color and tastes like an Andes mint. Dessert drinks are not a go-to for me, but this one was certainly a little bit of sweet fun. 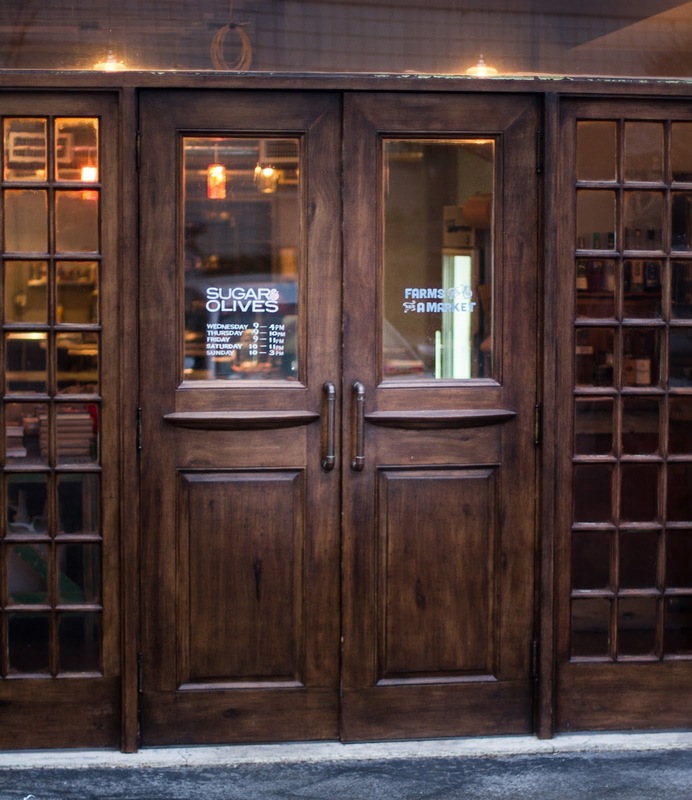 The menu at Sugar + Olives accommodates omnivores, vegetarians, and vegans. They serve lunch, dinner, and weekend brunch. There are a few menu staples but for the most part, the menu changes daily based on available, seasonal ingredients. We started with the rosemary flatbread with smoked bluefish pate and fennel fronds. I loved the light and crispy cracker-like flatbread. 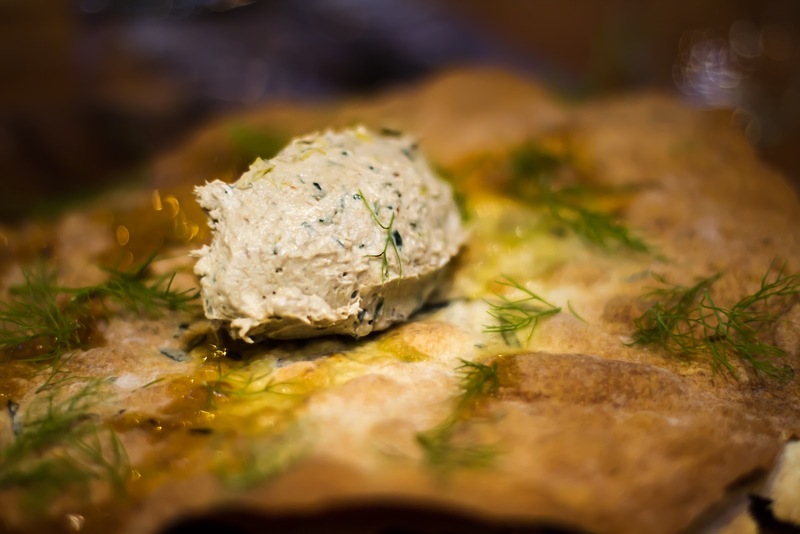 I enjoyed the texture and smokiness of the pate with the fresh rosemary and fennel, but to be honest, bluefish is just super fishy, not really my thing. Following the flatbread, we had the vegan rustic tomato soup. Wow, this soup tasted like summer. What more can I say? 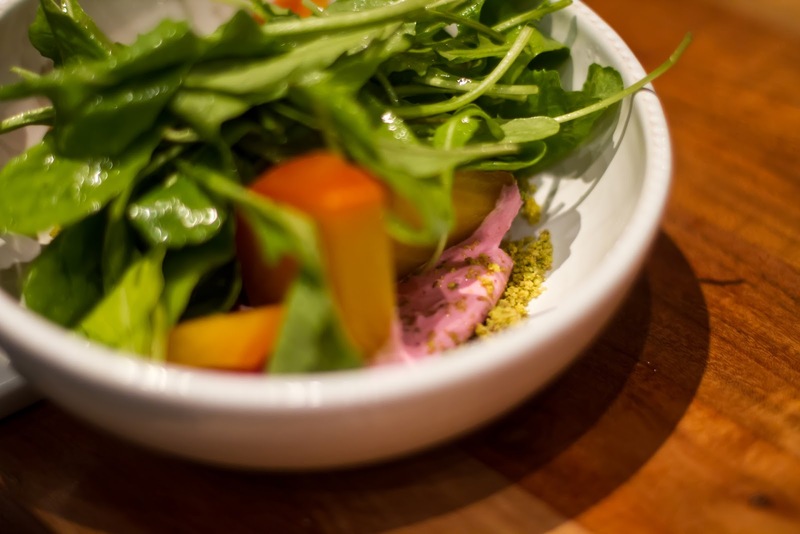 There was a wonderful play of textures in the smoked beets with goat cheese, arugula and pistachio dust. The creamy, tangy goat cheese was a great backdrop to the gently firm beets and lightly spicy tender arugula. This dinner was way back in March, so the arugula was especially tender as it was the first of the season from Millstone Farm. 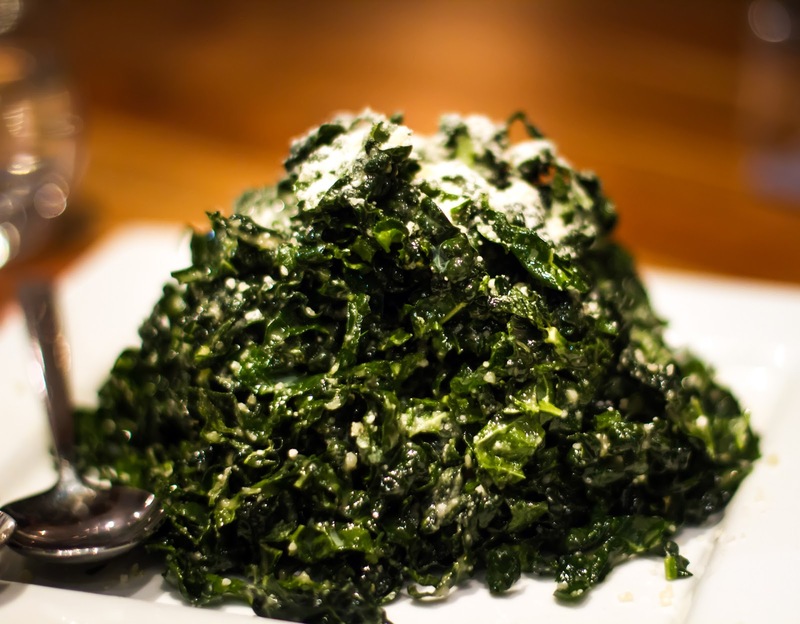 One of the most popular items on the menu is the kale salad. The dressing, which doubles as a marinade, is a combo of miso, maple, and shallots. It's savory and sweet. With the first bite, I understood why the dish is so popular. The sliders with bacon jam on chocolate toast were amazing. 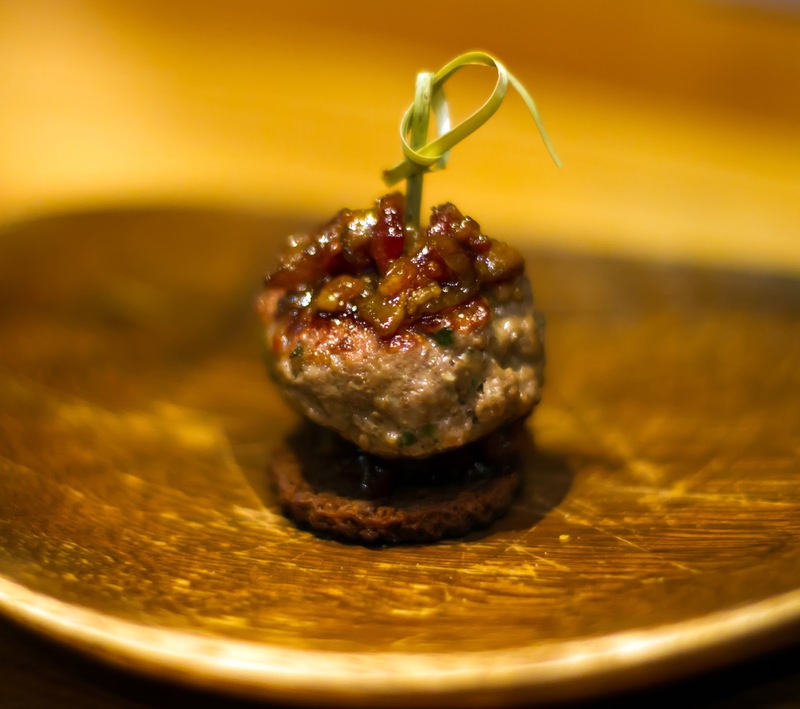 There was a hint of spiciness in the burger which played perfectly with the jam's sweetness and the meat's fattiness. Using the chocolate toasts for delivery was brilliant, as that grounded all the flavors with a bit of earthy bitterness. I loved these so much. 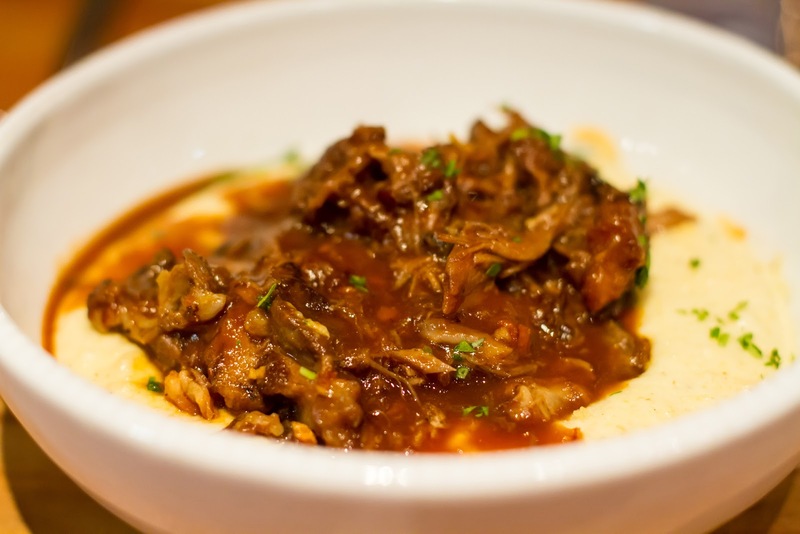 If you are in the mood for comfort food, then I definitely recommend the lamb ragu with polenta. The ragu was made with leftover roasted lamb from the previous day. This is the perfect example of the nothing wasted philosophy. The polenta was creamy, the roasted meat just fatty enough. This entree was served family-style, but I could have eaten it all by myself. The other entree that evening was anchovy chicken with cabbage cooked with mustard seeds in French Pavan (muscat grape and orange blossom liquor) and roasted carrots. This is a really interesting dish. It's unlike any flavor combination I've ever had. 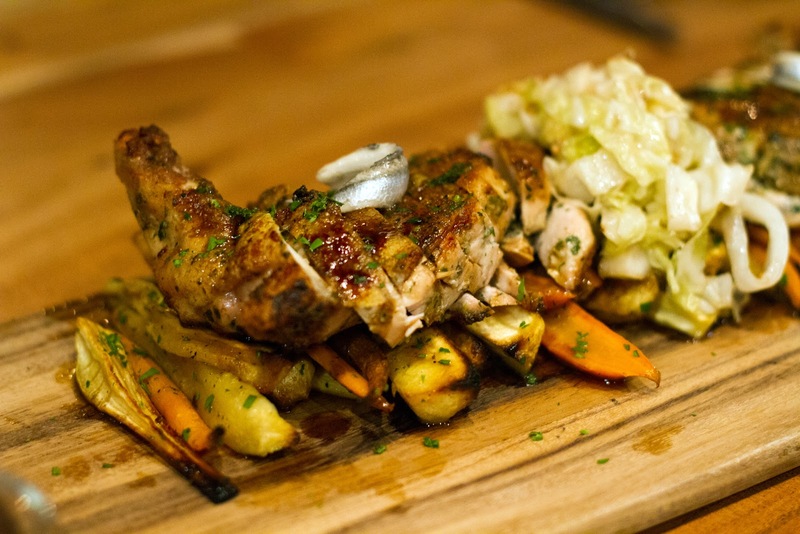 The tender chicken had that classic sea-saltiness from the anchovies. The cabbage similar to sauerkraut, tasted like grape jam, seriously, grape jam. 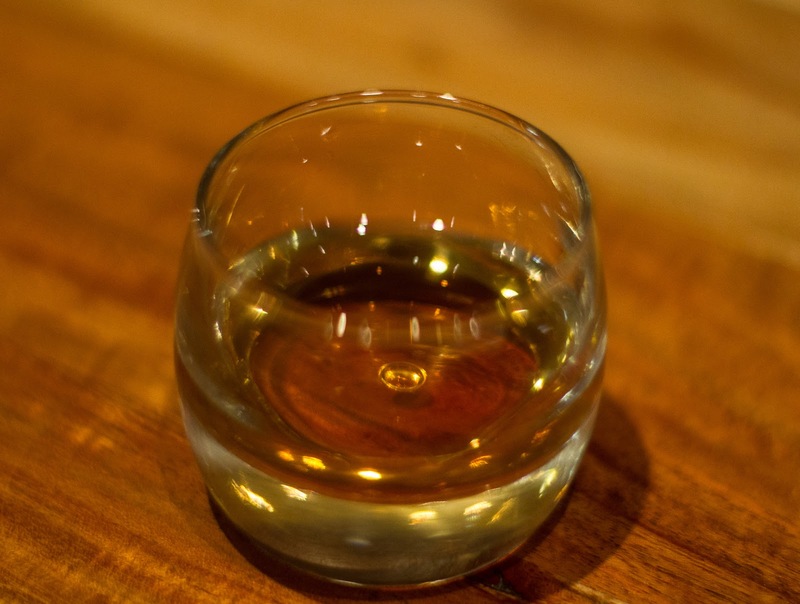 It doesn't sound like it works, but all the flavors - salty, sweet and earthy - meld together. Yes, of course, we saved room for dessert. The Guinness chocolate cake was spongy and rich. 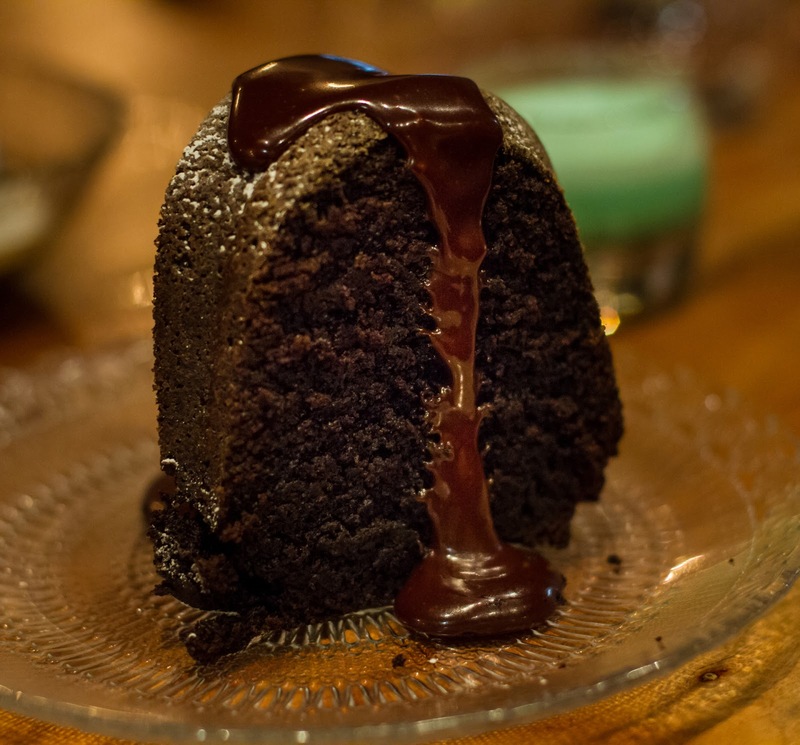 It's sure to cure your chocolate craving. 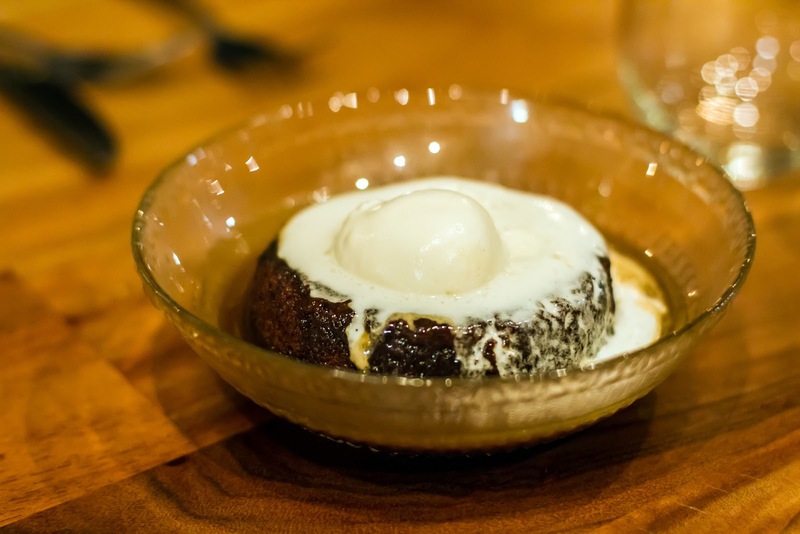 Then, we had the sticky toffee pudding made with dates, toffee sauce, and chantilly cream. OMG! Amazing. Worth every calorie! Forget the labels. Forget the trendy words. Real. That's the best way to describe Sugar + Olives. Sugar + Olives connects you to your food and the food experience. It might just be a meal that will put you on (or in my case back on) a sustainable, local food mission. Those drinks look ah-mah-zing!! great photos! looks delicious. Thanks Lauren. It's a great spot. Sugar and Olives is one of my FAVES! There are plenty of options for vegetarians as each and every element on the plate is celebrated from the farm where it grows. Looks like I need to check out the cocktails! Definitely! It was so good. I could go for the cake! Sticky toffee pudding! wow! The food and cocktails look amazing.